Oh, you think I’m joking. You think K.Mandla has gone off the deep end, and is probably sitting in front of a busted-up Pentium M spinning a 3D desktop in ASCII against the framebuffer. Ho-ho, you laugh. Ha-ha, you chortle. Okay, so my attempt at a screenshot hasn’t done much to convince you, but it’s tough to time fbgrab right to get a good look at the animation effect. Install it yourself on your quad-core with 12Gb of RAM, demean yourself to switch to the framebuffer, and try it. It works better than you think. 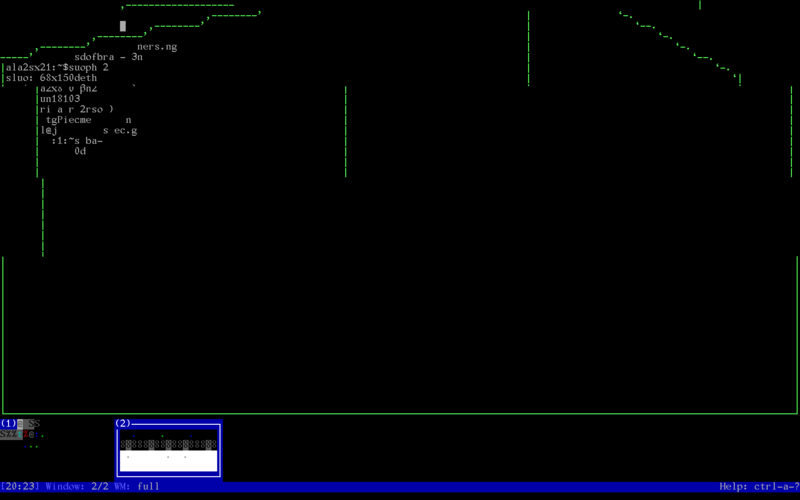 It, of course, is neercs, a wacky play on the traditional terminal multiplexer that appears to have been cross-bred with either 3ddesk or the ghost of Compiz. Either way, it’s good fun. I can coach you a little bit with neercs: You’ll start off with one “thumbnail” of a desktop along the bottom, and most of the key commands follow screen. Add another “desktop” with CTRL+A, C, then switch window layouts with CTRL+A, W, until you get the fullscreen model, meaning no layered or split windows. I didn’t either, so don’t feel bad. But believe it or not, you can indeed have a spinning cube desktop at the terminal. Yes, Virginia, there is a Santa Claus. neercs seems to be holding its own, although I did swap out my regular 12-pitch Terminus font for the gigantamo sun12x22 just for that image. This screen is 1680×1050, and that’s painful to watch at 1.7Ghz. 😯 I don’t think I’ll be trying this with a sub-1Ghz machine. neercs is in AUR as neercs-git, but doesn’t appear to be in Debian. Send your love letters (or hate mail) to the wizards of Caca Labs. I think I’ll just let you tinker with neercs, and you can decide if it’s something you want to keep around. I can give it a lot of points for doing the impossible — blending Beryl with the blinker — and it has a solid color scheme and is on the whole quite entertaining. This entry was posted in Linux and tagged multiplexer, terminal on 2014/11/03 by K.Mandla.